Lock in a great price for Hong Thien Ruby Hotel – rated 9.4 by recent guests! Excellent location! Friendly, helpful and patient front desk staff. Great shower with lovely hot water. Super clean room. When you arrive the staff greet us with a beautiful blended fruit juice - even after a tour! All of the staff speak excellent English! And I am sure they have the best prices for tours in the city. The Rooms are immaculate! Breakfast is really tasty! A one minute walk to the best location in the city before shopping and restaurants. But tucked away so that the Room is very quiet! Highly recommend this hotel. And the price couldn't be beat! My room was very clean on check-in and cleaned every day. The staff is very warm and kind - always had a smile on their face. For breakfast, they had several healthy and delicious western and vietnamese/asian options. The location may be a little to find at first as it is at the end of a narrow path, but once you know where it is, it’s easy to find. It’s location was close to the action but being tucked back, you couldn’t hear anything in the room. The reception recommended and booked an all day tour for me which I enjoyed. My stay here easy and I would highly recommend. The staff were extremely professional and very willing to please. We had to leave earlier than when breakfast was serve so they took our orders the night before to make sure the food was ready the next day. We were able to order as much as we want. I would definitely stay here again. Thank you. Extremely friendly and helpful staff. Good Wi-Fi. Great breakfast. Staff were generally very friendly and helpful. A number of little 'service touches' that elevated the overall experience. The breakfast was superb for this level of hotel. The fruit and drink welcome as I checked in was much appreciated and set the tone for the visit very well. Car pickup from the airport... great. And suggestions as to what made most sense in my one day available spot on. 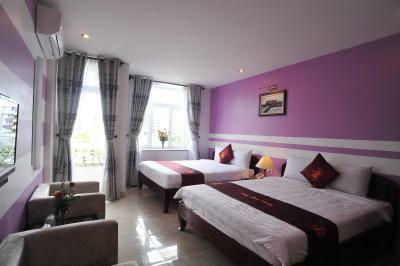 Everything about the Hong Thien Ruby Hotel was excellent. The room was luxurious, the staff friendly and accommodating, the breakfasts deliscious, the location, tucked-in at the end of a short alleyway, quiet yet in the heart of the center, and the price a bargain. 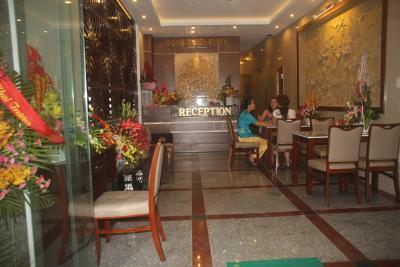 Hong Thien Ruby Hotel This rating is a reflection of how the property compares to the industry standard when it comes to price, facilities and services available. It's based on a self-evaluation by the property. Use this rating to help choose your stay! 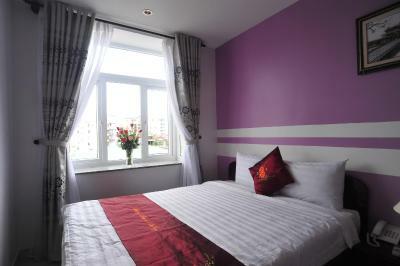 Hong Thien Ruby Hotel offers modern rooms with windows and a private bathroom. 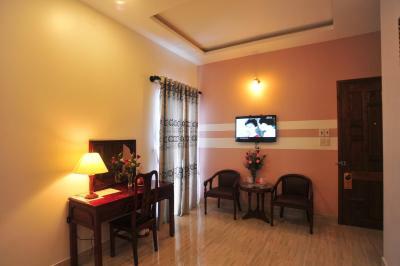 Free WiFi is available in the common areas of this property, which also provides free parking and a 24-hour front desk. 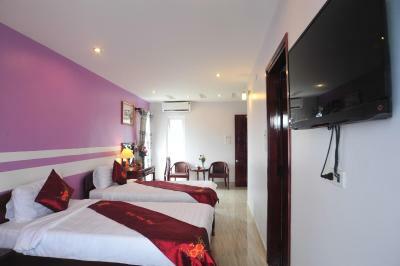 Located in Hue, the hotel is 2,950 feet from Dong Ba Market, 0.6 mi from Trang Tien Bridge and 0.9 mi from Chieu Ung Pagoda. Da Nang International Airport is 50 mi away. 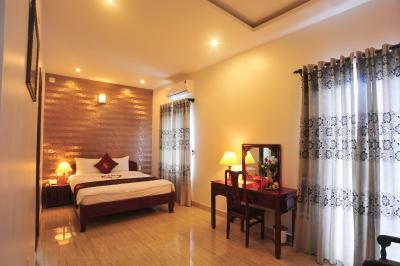 Each air-conditioned room features a flat-screen satellite TV and mini-bar. 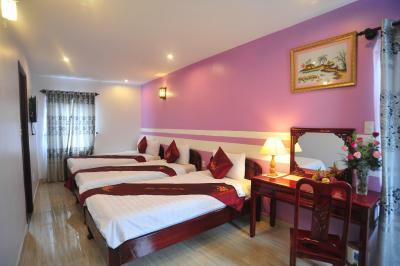 A seating area and private bathroom with shower, hairdryer and free toiletries are provided. 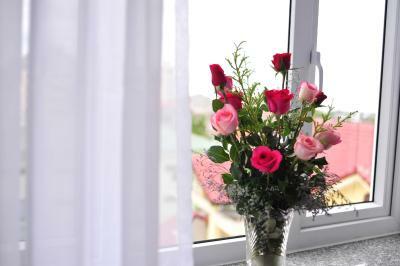 At Hong Thien Ruby Hotel you will find a garden and terrace. 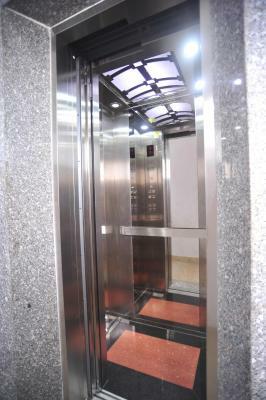 Other facilities offered include a ticket service, tour desk and luggage storage. 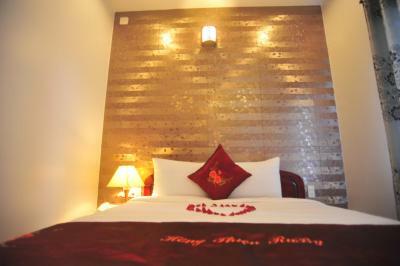 When would you like to stay at Hong Thien Ruby Hotel? 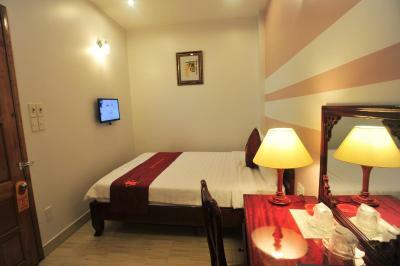 Offering a small window, this air-conditioned double room features a flat-screen satellite TV, mini-bar and tea/coffee making facilities. 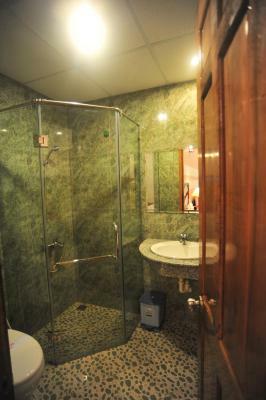 The private bathroom comes with shower facility, hairdryer and free toiletries. Offering a small window with views of the next building, this air-conditioned single room features a safe, flat-screen satellite TV and mini-bar. 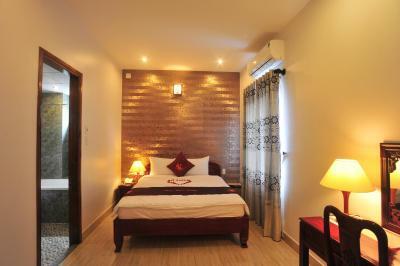 A seating area and private bathroom with shower, hairdryer and free toiletries are provided. 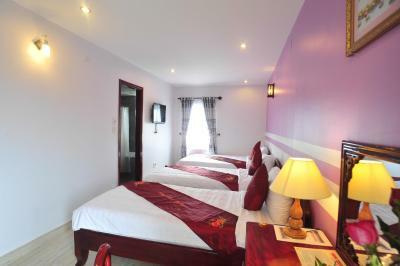 Offering a big window, this larger air-conditioned double room features a dining table, flat-screen satellite TV and mini-bar. 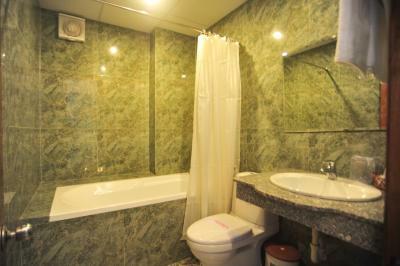 A seating area and private bathroom with bath or shower, hairdryer and free toiletries are provided. Select rooms offer views of the pool. 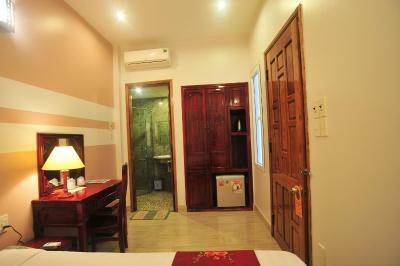 Offering a window, this larger air-conditioned double room features a balcony, safe, flat-screen satellite TV and mini-bar. 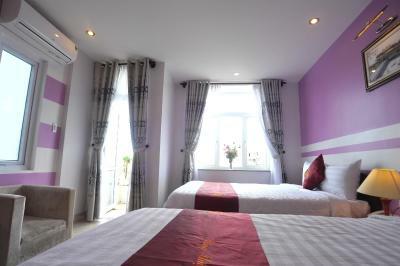 A seating area and private bathroom with bath or shower, hairdryer and free toiletries are provided. Select rooms offer views of the pool. 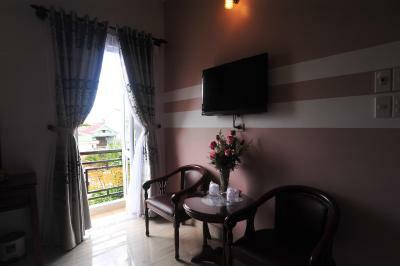 Offering a window, this larger air-conditioned triple room features a balcony, safe, flat-screen satellite TV and mini-bar. 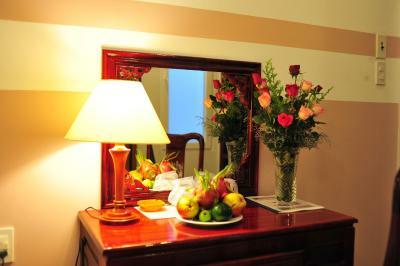 A seating area and private bathroom with bath or shower, hairdryer and free toiletries are provided. Select rooms offer views of the pool. Offering a window, this spacious air-conditioned family room features a balcony, safe, flat-screen satellite TV and mini-bar. 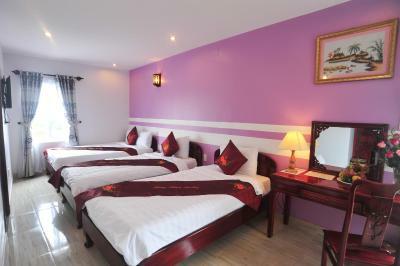 A seating area and private bathroom with bath or shower, hairdryer and free toiletries are provided. Select rooms offer views of the pool. 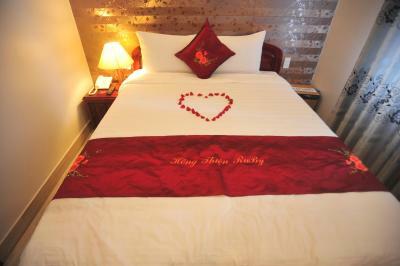 House Rules Hong Thien Ruby Hotel takes special requests – add in the next step! Hong Thien Ruby Hotel accepts these cards and reserves the right to temporarily hold an amount prior to arrival. Would have liked tea bags and coffee right in room BUT you could order it any time from front desk which was generous too! Close to the pubs but solid windows kept out nearly all noise. This is not really a negative point actually! Very helpful staff with good tips. Free welcome drink and shower on day of leaving. Good breakfast with fresh juice. Nice and friensly little business that they have! Very recomendable. It was fantastic. Nothing I didn't like. Pillows were too stuffed to be comfortable. A little noisy due to street music on a Friday night. A kettle was provided but no tesbsgs or coffee. Staff was friendly and helpful. Good tips for visits. We had a fantastic stay here with a welcoming fruit platter, drink and information on the town and experiences close by. 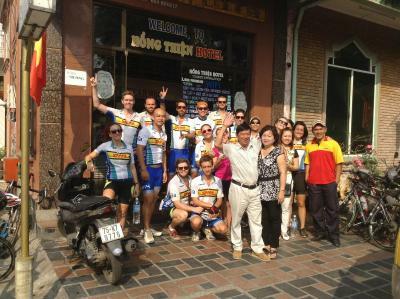 The staff were extremely friendly , speaking excellent English and happy to inform us and help us out with transfers and a trip to hoi an the next day. 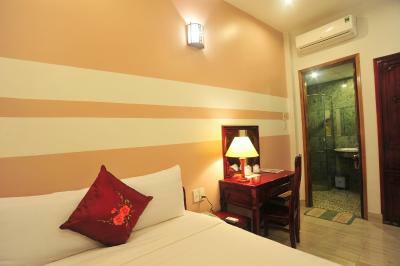 The room was one of the best we have stayed in-spotless clean, air con and quite modern with nicely painted walls. Even better, was a bargain price for what you recieve! Even though we arrived in the afternoon and left the next morning, the staff were happy enough to wash our washing and fold it ready to pack before we went to sleep.. the breakfast was an amazing scrambled eggs with cheese tomato shallots and onion in a baguette roll which was delicious. 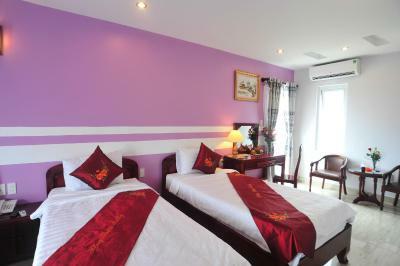 We recommend anyone travelling to hue to visit this hotel :)!! Thanks to you all for a great stay!!!! Very spacious room, could have fitted 4, while we were just a couple. Excellent location, 2 minutes away from the center of the action but surprisingly calm at night. Tasty breakfast with refills as per your needs. Friendly and attentive staff. Great location. Nice, comfortable and clean room - a lot of space.Room was spacious. Great breakfast. I really recommend this place. The hotel is close to all the restuarants and bars and yet tucked away and quiet. Staff were very attentive and helpful. Air conditioning did not work completely. 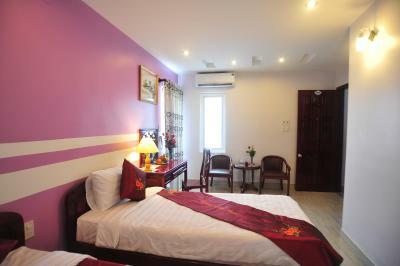 Nice and comfy budget hotel in the center of Hue. Excellent breakfast! You are able to choose anything you like to eat from the menu. The room was big enough for three people and it was clean also. The bathroom was also clean and shower worked well. 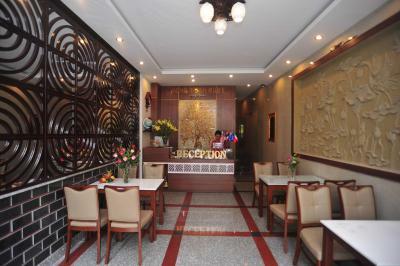 The staff was very polite and always ready to help you and give advises. 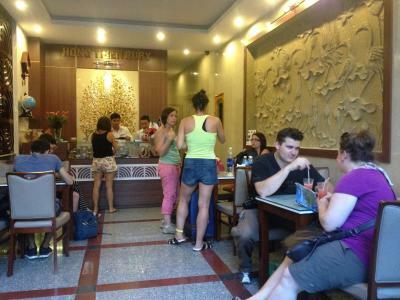 They helped us to book a taxi for sightseeing in Hue and bus tickets to Hoi an. This is a basic hotel and doesn't pretend to be anything else. Probably my only complaints would be that bed was a bit hard, even by Vietnamese standards, and lighting in bathroom was a bit dim, but again that's something I've found in hotels throughout this area. This is a wonderful place to stay for a few nights. The staff, I think it's a family operation, are super welcoming and accommodating. On arrival I was given a cold drink and a big plate of fruit salad. Breakfast is prepared fresh to order from a menu and guests are encouraged to ask for more. Location, though up an alleyway, is central, easy to find, and quiet. The Hoi An Express bus dropped me at the entrance to the alleyway. No complaints - great place to stay! The breakfast was our favourite from our whole stay in Vietnam! The room was lovely and so were the staff. The free fruit and juice on arrival was very much appreciated considering we arrived early and it was very hot outside. Loved the place. The staff was extremely helpful and kind. Facilities were good and so was breakfast.